After some time of staring longingly at the Hordes/Warmachine models I finally got a copy of the Hordes Primal Mk II Rulebook by Privateer Press. I do not have any models yet and I haven’t played a game, but I did finish reading the rulebook so I wanted to write up my thoughts. 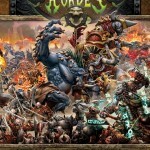 I will probably come back and write an actual review of the full game itself, but for now these are my thoughts on this book and what I know about Hordes now. Keep in mind that this is my first experience with the Iron Kingdoms so I will not be comparing this to the previous version of Hordes but rather looking at this with a set of completely fresh eyes and an open mind. 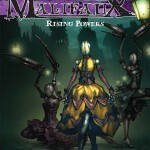 Malifaux: Rising Powers (aka Malifaux Book 2) is now available. Rising Powers is an expansion to last year’s new tabletop game that’s been making waves since it released. Malifaux is a unique take on tabletop games that uses a card mechanic in place of dice. If you’ve never played Malifaux, I’d suggest reading the Malifaux Review first to learn about the base game. Also, don’t forget to check out the Tabletop Geeks Malifaux Galleries or sign up to upload your own! Rising Powers expands on a few aspects of Malifaux. 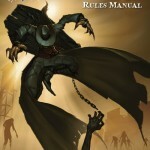 This new book adds a few new rules, a ton of new units, and of course more stories in the Malifaux world. While only a few new rules are added, they greatly improve on the basic gameplay. It should be noted that this is an expansion, and as such the original rules and model stats are NOT included in this book. This only includes new content. I am especially excited about this interview. We managed to get an interview with Nathan Caroland of Wyrd Miniatures. Nathan is one of the co-creators of Malifaux. He answered questions about himself and about Malifaux, and was even willing to share some of his painting work with us. Powered by WordPress v 5.1.1. Page in 0.971 seconds.